Most users find it easiest to upload their files or product data using our VizSeek Desktop App. You can use it to upload your product data or to sync with a folder or set of folders. Files are uploaded to VizSeek servers and indexed for search. You can also schedule sync operations so that your VizSeek account is always up-to-date. Are you a Mac user or having trouble with the desktop app? Get in touch with us and we'll help you get your files or products into VizSeek. NOTE that, depending on your browser, when downloading the software, you may receive a warning from your browser that it's not "commonly downloaded software." This is due to the software being new and not having many downloads yet. Continue through the warnings to download the desktop app. See below for more information on downloading in the various browsers. On clicking the download button, you'll see a warning at the bottom of your window. Click the down arrow by the Discard button and click Keep. You can continue to download from there. After clicking the download button, a window will open asking you to save the file. Click Save File and then click the Downloads button in your toolbar. 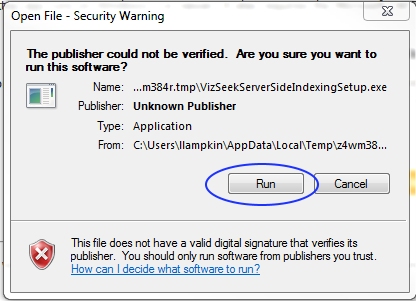 Click the appropriate file and follow the instructions to run the executable file. After clicking the download button, a message will appear at the bottom asking you to run or save the file. Click Run. 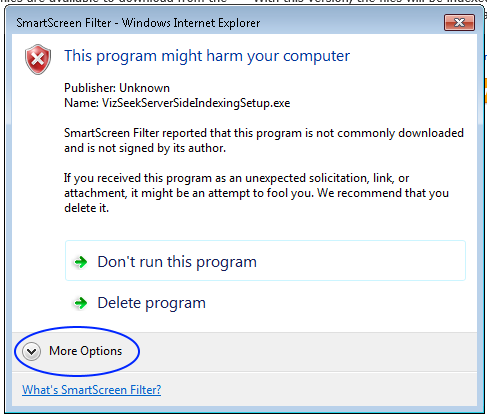 In the warning that follows, click Actions and then, in the window that opens, click More options and Run anyway. After you click the download button, two popups will appear. Click Run in the first, and then double-click the .exe file in the Downloads window. Thanks for signing up with VizSeek! Your first step will be to upload the content you want to search to your account. We'll index it, and then it's ready to be searched.